For use with the DermaTx Facial Tool in DermaTx Microdermabrasion Systems. The foam attachment head features a carefully selected foam pad manufactured for use specifically with DermaTx Microdermabrasion Creams. The massaging action of the foam head allows the mineral crystals in the creams to gently remove dead skin cells, polish the skin, and stimulate microcirculation. The cleansing brush attachment can be used for daily deep cleansing. Can be used with a cleanser of your choice. 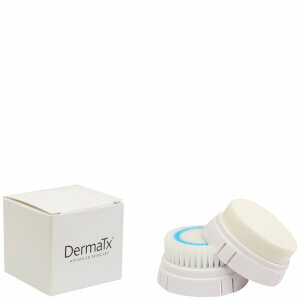 Attach the Exfoliating Foam Head to the DermaTx Facial Tool. Apply DermaTx Microdermabrasion Cream to Foam Head and dot onto clean moistened skin. Switch device on and using circular motions, massage the cream into the skin working different areas of the face for 2 minutes in total. Rinse off, dry face and apply a moisturiser. Perform treatments 1-2 times a week (or up to 3 times maximum if required) for optimal results. Attach the Cleansing Brush Head to the DermaTx Facial Tool for daily deep cleansing. Can be used with a cleanser of your choice.